The end of summer is the height of tomato season, and rightfully so, this month's challenge from the Creative Cooking Crew is to create a dish featuring this beloved seasonal ingredient. There are so many ways to utilize tomatoes in cooking, from making it the star of the show to giving it a memorable cameo. The recipe I actually planned to feature for this month's challenge is on hold until my local farm has yellow heirloom tomatoes ripe enough for sale, but I'm still hoping to share that recipe later this month. In the meantime, I'm sharing one of my favorite recipes featuring fresh tomatoes. 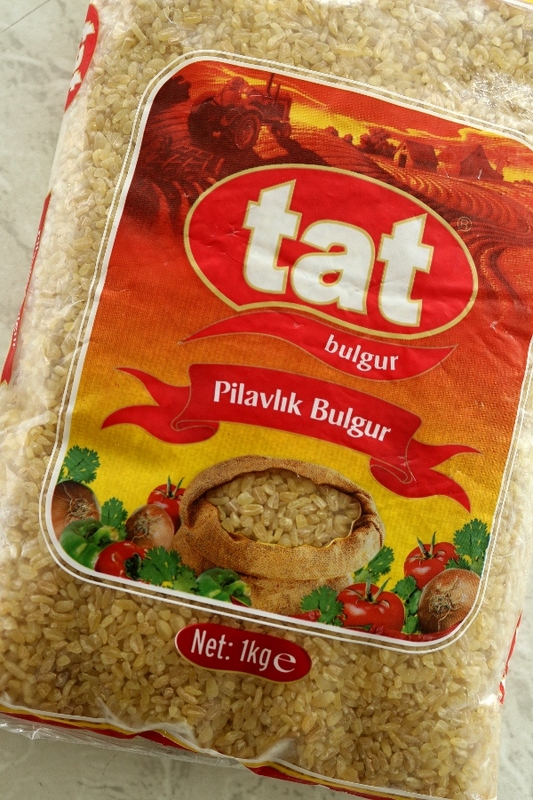 As an Armenian, I have eaten a lot of rice pilaf in my day, but I particularly love pilaf made with bulgur wheat--specifically coarse or extra-coarse bulgur which somewhat mimics the size and shape of rice. 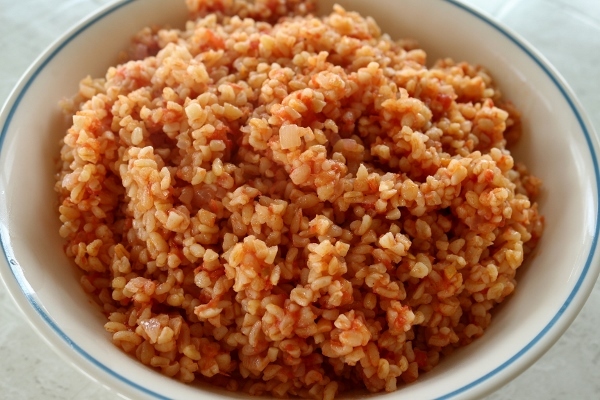 I love the flavor and texture of this bulgur, but what really takes it over the top is preparing it using fresh tomatoes and all of their juices as the main "liquid" for absorption in pilaf preparation. The easiest way to do this is to grate halved fresh tomatoes on a box grater (seeds included) until you are left with just the skins for disposal. 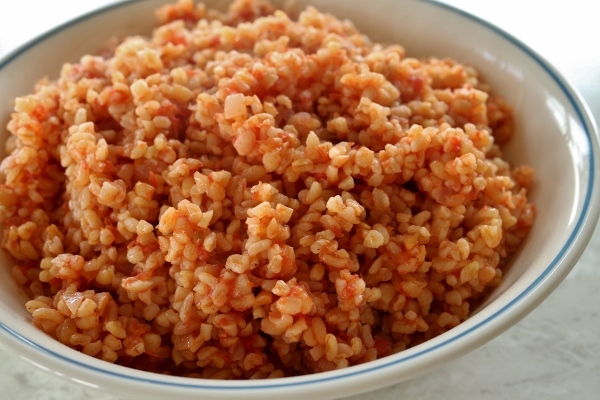 This juicy tomato pulp is then simmered with softened onions and a little extra boiling water before adding the bulgur, reducing the heat, and allowing it all to meld into one of my favorite summer side dishes featuring grains. This pilaf is surprisingly light for a starchy side dish, and it really showcases the flavor and color of the fresh tomatoes. 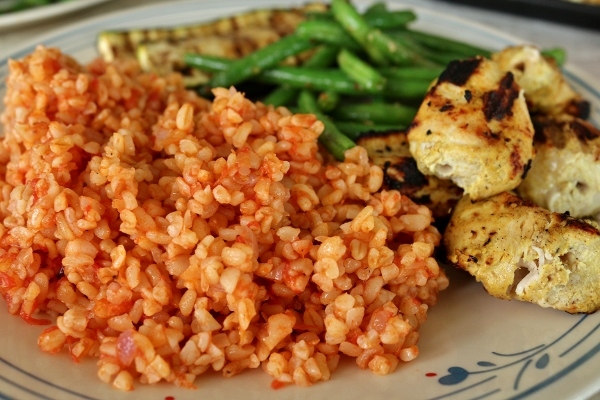 I've seen other Armenians make pilaf with bulgur, but often use finer bulgur (so not my favorite in this preparation) and chunks of tomato that seem more like an afterthought as opposed to a true counterpart to the bulgur. 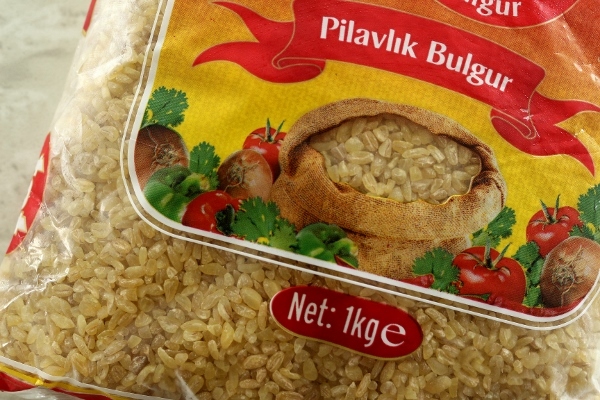 Coarse and extra-coarse bulgur (#4 or #5 bulgur) can be purchased in many Middle Eastern markets and can be found either pre-packaged or sold by weight; it's often labeled as Pilavlik Bulgur in Turkish which essentially translates to bulgur for pilaf. 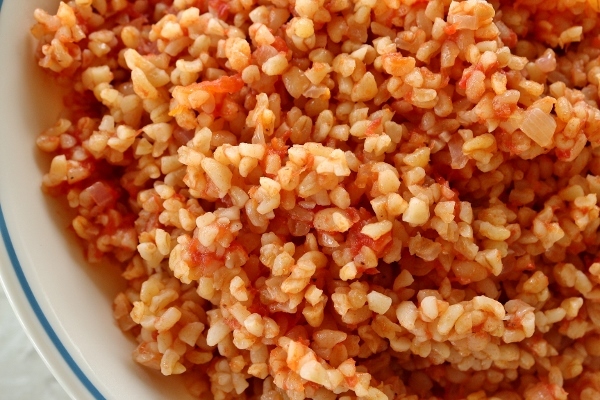 Store your bulgur in the freezer to keep it fresher longer. Head over to Foodalogue on August 29th for a full round-up of recipes! Melt the butter in a large pot over medium-high heat, add the onion and cook until softened. Add the grated tomato, bring to a simmer, then lower the heat to medium-low and cook, stirring regularly, for about 5 minutes. Add the boiling water, stir, and then add the bulgur, stirring again to combine. Season with salt and pepper to taste. When the mixture starts to bubble, lower the heat to low, cover, and cook for about 15 minutes, or until all the liquid is absorbed. Remove from the heat and let it rest for a few minutes before serving. *To grate the tomatoes, cut them in half (trimming the stem portion) and grate them with the cut side against the large holes of a box grater until only the skin is left in your palm. I recommend grating them directly into a bowl to catch all the juices, and then measuring the yield in a large measuring cup.